The normal energy patterns in the brain tend to remain the same until altered in some way. Previous research has shown that it can take weeks, months, or even years for significant changes to take place in the brain using other approaches.PSYCH-K creates a Whole-Brain state in relationship to a specific belief being addressed. This Whole-Brain state allows the Partner (person changing their belief) to create and open new neural pathways within the brain in relationship to this new belief. Now, with the validation of qEEG(Quantitative Electroencephalogram) Brainmaps we have visible scientific evidence of the differences being made within the brain activity.To assist in understanding the neuroscience related to the PSYCH-K® process, research is being done with a proven scientific method called Brain mapping. 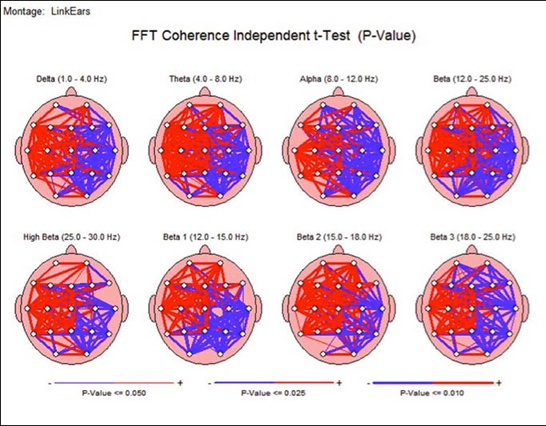 It measures brainwave patterns through 20 specific locations on the head, and then converts the gathered EEG data (electroencephalogram) information through a sophisticated statistical program, into visual patterns that can be compared to one another. When utilizing a PYCH-K® process, significant changes were indicated after only 10 minutes! The figure below is a sample taken from a two-year research study involving 125 cases. Brainmaps are unique to the specific individual, yet the research outcome is consistent with 98% of the participants establishing a Whole-Brain State. The result of PSYCH-K is that individuals have dramatically increased access to additional brain functions, giving them greater response potential to meet life’s challenges and opportunities.The following image indicates an increase in balance across the brain, between the left and right hemispheres, as well as harmony from front to back. Following PSYCH-K® balance, the brain of this person demonstrated a statistically significant shift in hemispheric coherence patterns. The RED COLOR represents brain activity BEFORE the PSYCH-K® balance process. TheBLUE COLOR shows the additional brainwave activity AFTER the PSYCH-K® balance process. Notice how the two colors create a more globally distributed energy pattern (Whole-Brain State), after the completion of the balance process.PSYCH-K processes allows new neural networks to be made, and/or previous neural networks to be re-activated. A PSYCH-K Balance is a process designed to create balanced communication with both hemispheres of the cerebral cortex. This “Whole-Brain State” is ideal for reprogramming the subconscious mind with new self-enhancing beliefs that support your goals rather than block them!